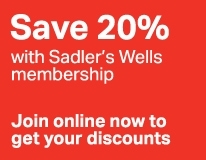 Since 1989, Company of Elders, Sadler’s Wells’ inspirational resident over-60s performance company, has been demonstrating the power of lifelong creativity and proving it is never too late to start dancing. In this mixed bill they bring new work from exciting choreographers including Adrienne Hart, Seeta Patel and Dickson Mbi. Showcasing their own unique styles, these choreographers draw out new ways of moving from this established company.